Jakarta – Consistency to be part of Indonesia’s automotive industry growth was accomplished by Toyota Indonesia and its group with a significant increase in the export sector. 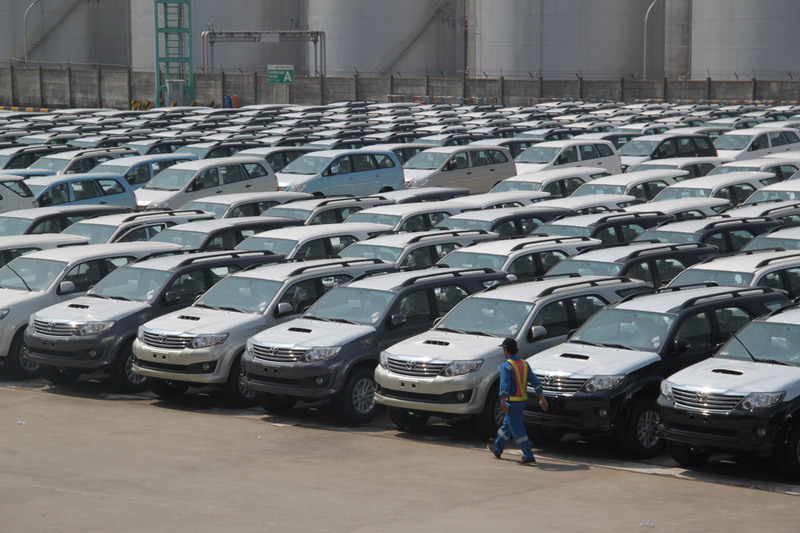 The increasing export of Toyota brand CBU (Complete Build up) vehicles is noted at 500% or five times the range total of 30,000 units in 2009 to 160,000 units in 2014. Toyota’s leap of export performance is achieved with some expansion to new area of destinations and the variation of export products are also increasing. For the first time in 2010, PT Toyota Motor Manufacturing Indonesia (TMMIN) export a whole environmentally friendly, bioethanol-based machine to Argentina with an average volume of 600 units per month. The next expansion of exports made in 2013, by expanding export destinations for the IMV series (Fortuner and Kijang Innova) to Latin America and the Caribbean countries up to 600 units per month. In 2014, Toyota Indonesia and its group respectively enhance their export performance. In February, Agya exports to Philippines starts with a volume of 500 units per month. Agya becomes the first LGCC (Low Cost Green Car) vehicle that penetrated the foreign market. The next month, in March 2014, Toyota Indonesia started to export Vios as the first Indonesian-manufactured sedan. It was exported in a significant number of 1,500 units per month in its early stage. This number, by its development, increased up to an estimated of 3,500 units per month. Completing the export performance of Toyota brand CBU vehicles, Avanza penetrated the Middle East market since April 2014 with an estimated volume of 500 units per month. “As an export-oriented manufacturing company, we always strive to create competitiveness in order to win the competition in the highly competitive global market. One of our way is to increase the depth of the industry. We believe that the power over the industry would bring high competitiveness”, said Warih Andang Tjahjono as the Vice President Director of TMMIN. TMMIN depth of industry could be portrayed in its thorough production process from engine block casting to the assembly process of a completely built vehicle. To support the efforts in increasing the depth of TMMIN industry, TMMIN has 5 production facilities which are located in Sunter and Karawang area. There are 2 plants in Sunter are. First is Sunter Plant 1 which is responsible for the engine production and the packaging of the exported components. Second is Sunter Plant 2 which is responsible for engine block casting and vehicle body pressing. This plant is the first casting plant in Indonesia. In Karawang area, TMMIN has 2 integrated vehicles production plant, from stamping, welding, painting, to assembling, that creates world-class vehicles such as Kijang Innova, Fortuner, Vios, and Yaris. Additionally, TMMIN is undergoing the completion of new engine plant called Karawang Engine Plant. This plant is planned to start its operations in the first semester of 2016. In the first two months of 2015, the volume of Toyota vehicles reached 28,800 units. It increases by 32% compared to the same period in 2014, consists of 8,600 units of Fortuner, 2,500 units of Kijang Innova, 7,200 units of Vios, and 6,500 units of Avanza. Meanwhile, the export volume for Rush, Agya, and Town Ace/Lite Ace are 4,000 units in summary. Export volume for CKD (Complete Knock Down) vehicles were 6,100 units, 5,500 units for gasoline-based engines, 1,200 units for ethanol-based engines, 11,2 million units for vehicle components up to February 2015. TMMIN was also exporting production tools in the form of die (aiding tool in the pressing process) and jig (aiding tool in the welding process) to various countries across the world. “Nowadays there are total 70 countries in the Asia-Pacific region, Latin America, the Caribbean, the Middle East, and Africa that becomes Toyota group export destination. We will continue to improve our export performance in the future in accordance with our spirit to be a part of the ever growing national automotive industry growth”, said I Made Dana Tangkas, Corporate Director and External Affairs in TMMIN. Toyota is committed to grow alongside the Indonesian society in accordance to the spirit of Toyota Berbagi (Bersama Membangun Indonesia) by providing products and technologies that aligned with customers’ needs, being a part of the national automotive industry development, and taking an active role in social activities.